anyone care to befriend the new kid? 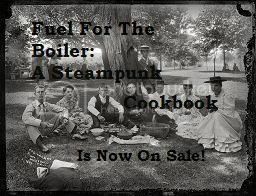 The Steampunk Forum at Brass Goggles > Non-Steampunk > Off Topic > The Off-Topic Historical Society > anyone care to befriend the new kid? Broken hearts change the mind, notice that they'er killing mine. Re: anyone care to befriend the new kid? aah well relating to me might be bad for ones mental health. however welcome to the forum and i hope you enjoy it here as much as i do! I need new crew for my airship! We did sweeny todd for the school musical. It is a really rather exceptional play. i know i lvoe the musical before i saw the movies and it was great! i do love it...i am alot like him. any one have a deviantart ? sweeny todd is a good one, gotta say i really enjoyed the newer version, had a nice feel to it. its nothing compaired to it being live however. so what drew you into steampunk? clockwork? crazy inventions? victorian fashion? or the ever present goggles? "Our airships will blot out the sun as to a cloud!" "Then we shall take tea in the shade." http://bolter.blog.com/ <-- my personal prop blog. and i like it very much here. You're a lot like Sweeney Todd? Hello, Ms. Lovett! I've not seen the Johnny Depp version of Sweeny Todd of which I assume you speak, but I did enjoy this one quite a bit. What area of these United States do you hail from? "...it's a form of fiction, and as such, while there may be times when it's considered a worthy vehicle for pointing out some of society and individual flaws - I still want a side that will let there be lighthearted adventures in the clouds, on mars, or under the sea." unfortunately, you've just entered a competition to see who can out weird each other, there are no rules. well there are, but it's trial and error y'ken? I was just thinking that quote in your signature looked terribly familiar! Welcome aboard. Slight insanity has been found to work here. but with dignity, grace and style. while those with it in abundance thrive..
And I out-wierd you 10:1 again. zomfg roflbbq! a gurl on teh forum!! okok bekewl.. LAWL! pixplzkthx! <-- We shall have none of that nonsense around here. Welcome to the loony bin! I always read that as Devian Tart. Welcome! What kind of meat do we have today? lol i just enjoy the show here. im that special kind of odd. there is one of me in every family. you know the one odd ball that they cart out at every holiday so everyone can giggle at the odd things they spout off about.